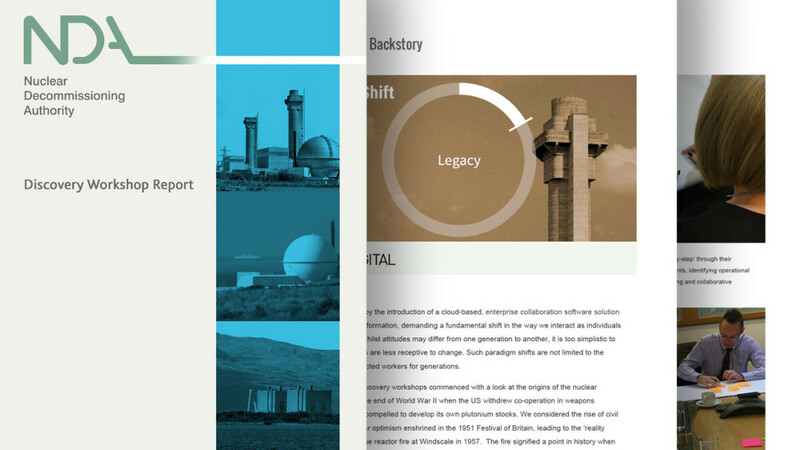 Case Study: Nuclear Decommissioning Supply Chain. The Nuclear Decommissioning Authority (NDA) is a UK Government Parent Body Organisation (PBO) with responsibility for management and restoration of legacy nuclear sites and disposal of radioactive material. Security, governance and regulation are key concerns and stakeholders span several sectors including, energy, transport, defence, health, the environment, and scientific research. The first objective was to scope the technical requirements for an enterprise social media platform. Jive Software was selected on account of its ability to support Official Sensitive classified information. Jive was shown to out-perform competing enterprise desktop IT platforms (Nielsen) and is used by Apple, T-Mobile, Virgin Media and other online knowledge-based customer support services. Technical specifications notwithstanding, this multi-million pound collaborative space would demand significant culture-shift from the NDA estate and its associated supply chain. 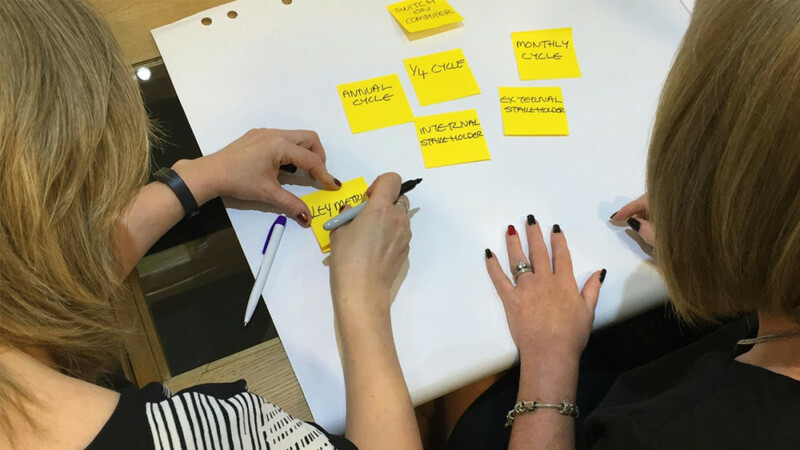 – The UX Discovery Workshops were designed to surface potential areas of conflict and fashion positive outcomes to the issues involved. A phenomenon affecting many established organisations in the developed world is that of ‘the demographic cliff’ as baby-boomers begin to retire taking with them years of experience. A key objective of the UX workshops was to explore the issues concerning the the transfer of valuable domain knowledge from baby-boomers at one end of the demographic spectrum, with millennials at the other – using the intuitive sharing conventions being established by social media. Engagement with senior stakeholders and the supply chain began with a presentation which looked at Britain’s Cold War history. This helped to build an understanding of the paradigm shift that came about in the 1950’s with the move towards civil nuclear power generation. The responsibility of managing this legacy for future generations is an enormous undertaking, demanding forward-planning, knowledge transfer, and resilience that will be required to span decades! Focussing on the cultural heritage of the organisation helped to engender trust, empathy and ‘buy-in’ from candidates selected to engage in the discovery workshops. What’s your day like? – Workshop candidates examine routine operational processes. 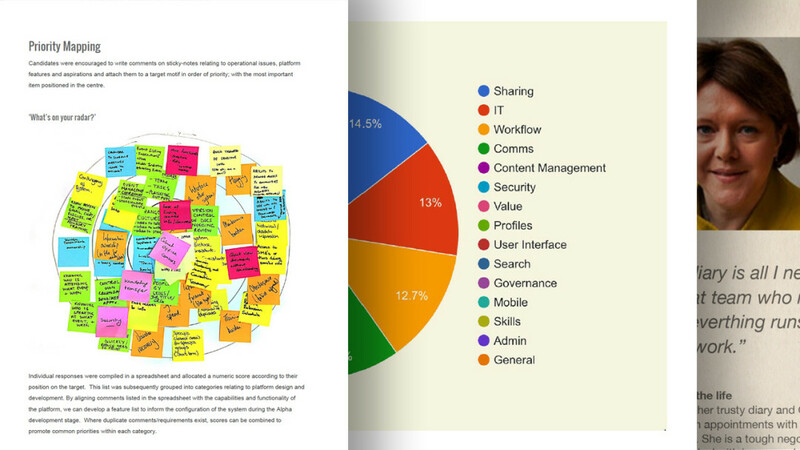 Cluster maps, process workflows and proto-personas; the result of collaborative design sessions were used to explore and visualise the operating environment and technology touch-points. The sessions helped introduce multi-disciplined teams to the potential benefits of sharing information in a collaborative space. The notion of sharing sensitive information is in itself a huge paradigm shift for the sector – a transformative process that I have termed from Silo to Social. Research findings were analysed and presented in a Discovery Workshop Report to help inform strategic development across the estate. 50’s Sci-Fi Hero Dan Dare, The Festival of Britain and Apollo 8’s iconic Earthrise picture (1968) helped introduce workshop participants to the concept of the paradigm shift. Britain’s post war drive to build atomic weapons led to development of experimental civil nuclear power facilities that promised ‘unlimited power’ at low cost – a point openly popularised in newsreel footage from the time.To make the discovery workshops more interesting, presentation materials were themed around 50’s iconography, including; political figures, the science-fiction character Dan Dare and the Festival of Britain: Bold, post-war icons which expressed the idea of a technological utopia. By contrast, the stark beauty of the Apollo 8 Earthrise (1968) and the terror of Windscale No1 Reactor fire (1957), represent paradigm shifts that challenge fictionalised visions of the future. The Windscale fire exists as a significant ‘wake-up call’ in the folk-memory of the industry as it served to highlight the true extent of our responsibility to future generations, which is the very essence of the NDA. This media-rich backstory helped to frame arguments surrounding clandestine working practices, information silos and repositories, reducing resistance to the proposed knowledge hub which borrows the conventions of social media platforms and encourages collaborative working. Cluster mapping reveals important issues that affect stakeholders. Surfacing this information helps to inform the design process in the area of Information Architecture (IA), Taxonomy, Search and User Interface (UI) Design. 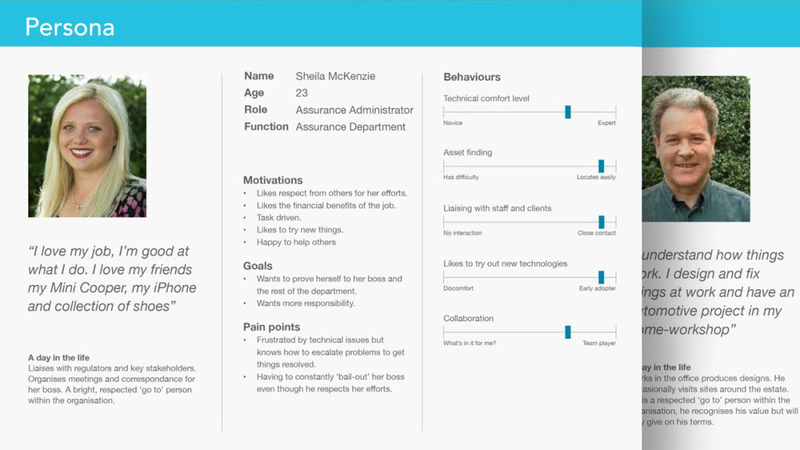 The creation of Proto-Personas help to understand demographics and user behaviour in different areas of the organisation and supply chain. By identifying pockets of resistance, we can tailor on-boarding activities to different user types, maximise engagement and platform adoption. Designing the technical framework for an enterprise platform is only part of the solution. There exists many examples where platform adoption has failed due to inadequate internal communications or poor content. To mitigate the risk of low-adoption rates, the UX discovery process was followed by a second phase of design activity with the aim of presenting recommendations for a Platform Adoption Strategy. These additional guidelines could then be used by internal marketing teams within the Site Licensed Companies (SLAs) across the NDA estate. This second phase of engagement with its emphasis on creative deliverables also presented an ideal opportunity to suggest a name for the knowledge hub, a process which began as a simple exercise in the original discovery workshops. Dismissing the acronyms that are commonplace in government organisations, the name Crucible was selected, a name which resonates within the industry as a place where reactions take place and one that embodies the idea of people coming together around a single idea rather than individuals exchanging multiple documents – with all the risks associated with data security, duplication, version control, siloed information and abandoned data repositories. The NDA Crucible – Platform Adoption Strategy highlights the actions required to affect behavioural change and maximise engagement with the new platform. Interventions include; seeding the platform from day-one with special interest communities, rolling out an on-boarding programme to new users, and the provision of reference material and video user-guides based around common use-cases.